OF THE MANY different types of agriculture that exist worldwide, shifting cultivation is today most common in forested tropical and subtropical regions. It was once much more widespread in areas where permanent agricultural systems now exist, such as the temperate and Mediterranean zones, as agriculture emerged from hunting and gathering and spread from centers of origin in the Near and Far East. It involves the clearance of a small plot of land that is cultivated for a few years until declining fertility causes the farmer to move to on and repeat the process. The abandoned plot then recovers its fertility as the forest recolonizes during a fallow period. The continual relocation of cultivation underscores a nomadic lifestyle. Today, shifting agriculture supports between 300 and 500 million people who comprise indigenous groups with an intimate and inherited knowledge of the land and a relatively new group of cultivators who have abandoned the poor environments of fast-growing cities in developing countries in favor of a life in the forests. The latter lack expertise; their efforts often cause environmental problems and harvests are usually below those of the experienced farmers. 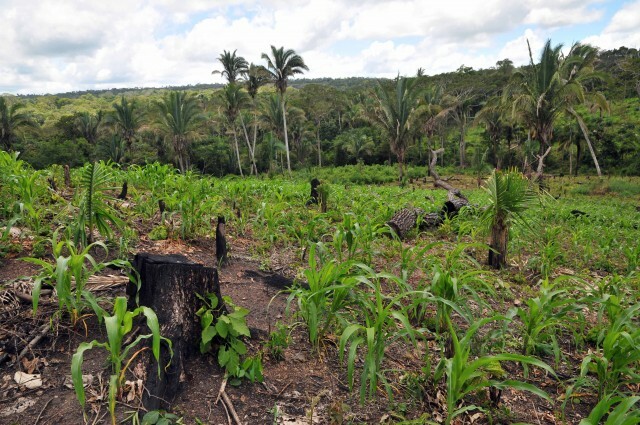 Shifting cultivation is considered to be a major cause of deforestation in the tropics. The first stage in shifting cultivation is the removal of the natural forest. This involves cutting and usually burning, processes that have generated the term slashand-burn. Good management involves selective rather than complete tree removal. Trees that produce a fruit or oil crop, or provide fodder, shelter and firewood, are retained. They provide protection for the soil and a source of seeds for forest renewal after cultivation is abandoned. Stumps of other species may also be retained for the same reasons. Controlled firing clears surface twigs and ground plant species and is best undertaken toward the end of the dry season so that crop planting can take advantage of the first rain. The burning of biomass, that is, the organic material of the vegetation, creates ash, the nutrients in which are generally soluble and so enter the soil with percolating rainwater. Thus, burning speeds up nutrient cycling in the ecosystem by accelerating their release from the biomass which would otherwise decompose relatively slowly. Immediately following firing, the land is at its most fertile because of this nutrient availability, but the soil is at its most vulnerable because the lack of a vegetation cover exposes it to the impact of wind and rain. At this stage erosion should be minimized through the maintenance of some of the natural vegetation, that is, the trees referred to above, and rapid crop planting. Other soil conservation measures include the siting of logs or soil dams horizontally where land is sloping. These measures contribute to the equally important management of nutrients, most losses of which occur at the vulnerable stage between burning and planting, and often when heavy rains are beginning. Leaching of nutrients through soils and below the root zone means that they are unavailable for plant growth and are effectively lost from the system. Good nutrient management also requires the retention of crop residues in the cultivated plot so that nutrients are returned to the soil when they decompose. Weed control through hoeing is also necessary. In most shifting cultivation systems a variety of crops are grown, each with different nutrient requirements and each having a specific use. Each farmer aims to grow sufficient crops for the family for food, medicine, and possibly fiber and fuel, as well as fodder for a few animals that supply all-important proteins such as as milk and eggs. This is a form of subsistent agriculture that is essentially noncommercial. However, some subsistent crop farmers may interact with nomadic herders, as on the margins of crop growing in sub-Saharan Africa, with the effect that carbohydrate-rich crops are traded for the nutrients of animal manure. Plot fertility declines rapidly and farmers move on after two to three years and repeat the process elsewhere. Forests recolonize the abandoned plot. Provided that cleared plots are not too large, forests will reestablish in about 15 to 20 years. The trees-soil-litter relationship will have been reconstituted and a large store of nutrients built up in the vegetation and the litter. Indeed, many trees have shallow roots that facilitate nutrient recycling between the litter and the vegetation, with the soil contributing only a small nutrient pool. Subsequent burning for cultivation disrupts this relationship, but the system can be sustainable over long periods if the fallow period is sufficiently long. Where reburning occurs within too short a period, caused by increasing populations and land shortage, productivity of the plot declines and harvests are poor.